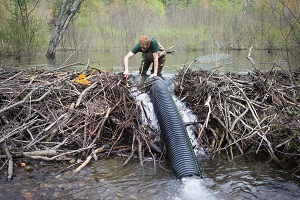 Vermont Business Magazine To prevent flooding on nearby roads, the Vermont Fish & Wildlife Department recently completed construction of 19 water control devices on beaver dams in locations throughout Vermont. Known as ‘beaver baffles’ these devices allow some water to pass through the dam without breaching the dam and destroying the wetland. The Fish & Wildlife Department expects to continue to install additional beaver baffles throughout the state this year. The baffles are one of many techniques that department staff employ or recommend to landowners to minimize beaver damage to property or trees. Other techniques include using fences to protect culverts, or placing wire mesh or special paint around the base of trees to prevent gnawing.
" The wetlands that beavers create provide critical habitat for a variety of wildlife such as waterfowl, songbirds, frogs, turtles, and otters. These areas can also absorb extra water during rain events and clean pollutants from water, so we work hard to preserve these wetlands.” said Kim Royar, wildlife biologist for the Vermont Fish & Wildlife Department. Fish & Wildlife Department for assistance at www.vtfishandwildlife.com. They can also contact private contractor Skip Lisle at www.beaverdeceivers.com.